I said somewhere in this blog that music is always of a time and place. This is true also of modern music whose cultural center was Paris and Sergei Diaghilev’s Ballet Russe beginning in 1909. Other people can write about the ballet--I'm interested in the music. There was an incredible explosion of new music beginning with Stravinsky's The Firebird (1910)and Petrushka (1911). 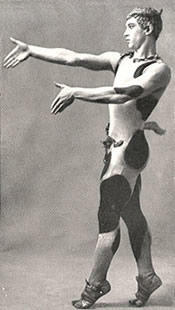 The picture of Najinsky at left is from Debussy's L'Aprés-midi d'un faune (1911). I choose to believe this was the impetus for modernism and not Arnold Schoenberg's marital crisis. (Schoenberg’s switch to atonality precisely coincided with the affair and subsequent departure of his wife. Coincidence? I don’t think so.) Strauss’ Salome was a precursor. This music was dominated by dance rhythms and harmonic clashes, and generally did not support the kind of lyricism found in opera. Opera and dance lived side by side in the Parisian Grand Opera tradition, but separated after this.